Experience The Mountain Parks photo/video 2010/2011 contest might be over, there is another one worth knowing about. The Friends of Kananaskis Country along with the Government of Alberta, Parks Division are running a poster photo contest. 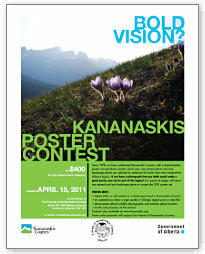 Poster sales proceeds will support the Friends of Kananaskis Country. Prize in each category is $400, and great exposure. Deadline is April 18, 2011. This isn’t the first time we’re supporting this initiative. Back in May 2010, we already talked about their 2010 posters that just came out.